“I try to take the long view. I think that every epoch has had its fantastical producers. I’m really interested in Manny Farber right now. He had two classifications for art: white elephant art—this huge thing, Stella, Koons, Canova, Cabanel—and termite art: Manet, Moyra Davey. Thursday, October 18, at 7 pm. MOCA Grand Avenue, 250 Grand Avenue, downtown Los Angeles. See Farber on Film: The Complete Film Writings of Manny Farber, ed. Robert Polito (New York: Library of America, 2009). Lethem is a contributor to Termite Deluxe: Manny Farber Writings and Paintings, a forthcoming volume exploring Farber’s life and work. Top: Manny Farber, undated photograph, courtesy Patricia Patterson. Above: Manny Farber, Story of the Eye (detail), 1985; oil, graphite and masking tape on board. Museum of Contemporary Art, San Diego. Below: Manny Farber, Domestic Movies, 1985; oil on board. ResMed collection, San Diego. Image credit: Museum of Contemporary Art, Los Angeles. This entry was posted in ART, BOOKS/PERIODICALS, CONVERSATION, EDUCATION/ACTIVISM, LITERATURE/POETRY and tagged Helen Molesworth, Jonathan Lethem, LARB Los Angeles Review of Books, Los Angeles Review of Books, Manny Farber, MOCA Grand Avenue, Moyra Davey, Museum of Contemporary Art San Diego, One Day at a Time—Manny Farber and Termite Art, Paris-LA, Paris-LA #14, Patricia Patterson, Robert Polito on October 16th, 2018 by Barlo Perry. 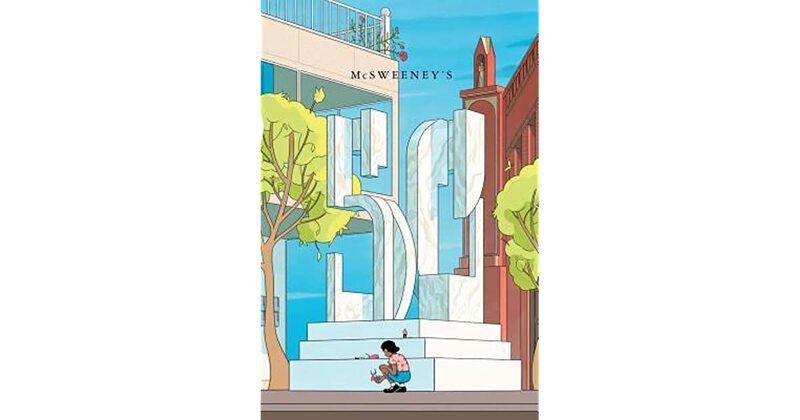 Join Kevin Moffett, Corinna Vallianatos, Sarah Walker, Carson Mell, and Brian Everson (who will all give readings) at the release party for Issue 50 of McSWEENEY’S, the quarterly founded in 1998 by Dave Eggers. The new issue—in a hardcover book format—includes contributions by Carrie Brownstein, Chimamanda Ngozi Adichie, Thomas McGuane, Sheila Heti, Kevin Young, Jonathan Lethem, Lydia Davis, Sherman Alexie, Etgar Keret, Diane Williams, Sarah Vowell, John Hodgman, and Steven Millhauser. McSWEENEY’S 50th ISSUE PARTY, Tuesday, August 29, 2017, at 7:30 pm. SKYLIGHT BOOKS, 1818 North Vermont Avenue, Los Feliz, Los Angeles. This entry was posted in BOOKS/PERIODICALS, CONVERSATION, LITERATURE/POETRY and tagged Brian Evenson, Carrie Brownstein, Carson Mell, Chimamanda Ngozi Adichie, Corinna Vallianatos, Dave Eggers, Diane Williams, Etgar Keret, John Hodgman, Jonathan Lethem, Kevin Moffett, Kevin Young, Lydia Davis, McSweeney's, Sarah Vowell, Sarah Walker, Sheila Heti, Sherman Alexie, Skylight Books, Steven Millhauser, Thomas McGuane on August 29th, 2017 by Barlo Perry.